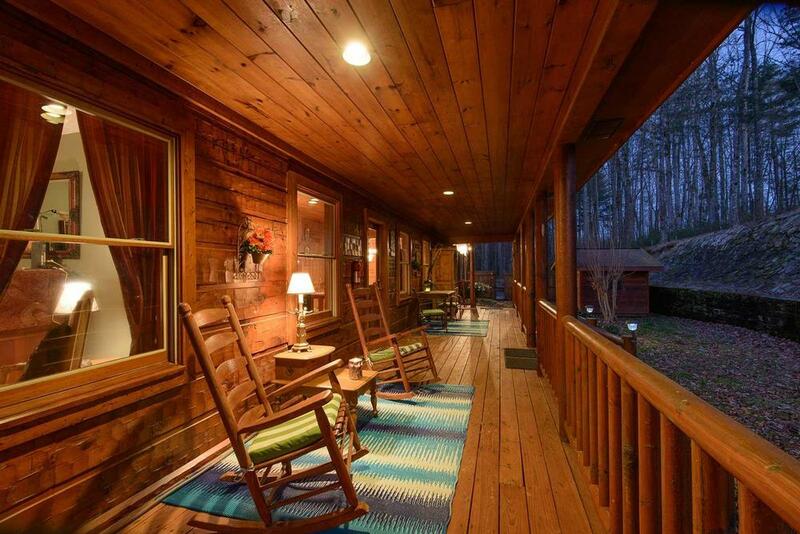 If you dream of a peaceful, relaxing escape for your next vacation, look no further than the Blue Ridge, Georgia cabin rental called Serenity Lodge and Stable. 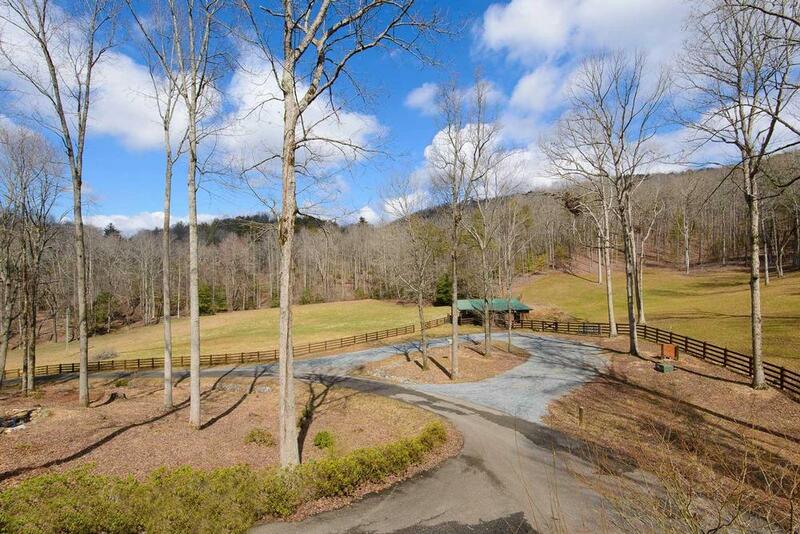 True to its name, this magnificent property located five miles west of Ellijay, GA offers the ultimate in serene tranquility, bringing you closer to nature while you enjoy all the modern amenities it has to offer, both indoors and out. There’s a koi pond on the property, and if you, like the owner, love horses, feel free to bring your own. 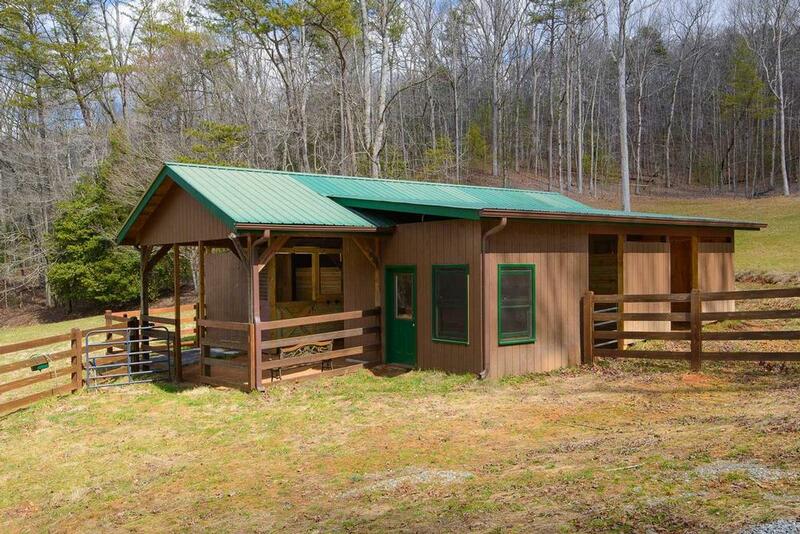 As the cabin’s name reflects, there’s a stable across from the cabin and the spacious driveway can accommodate a horse trailer. 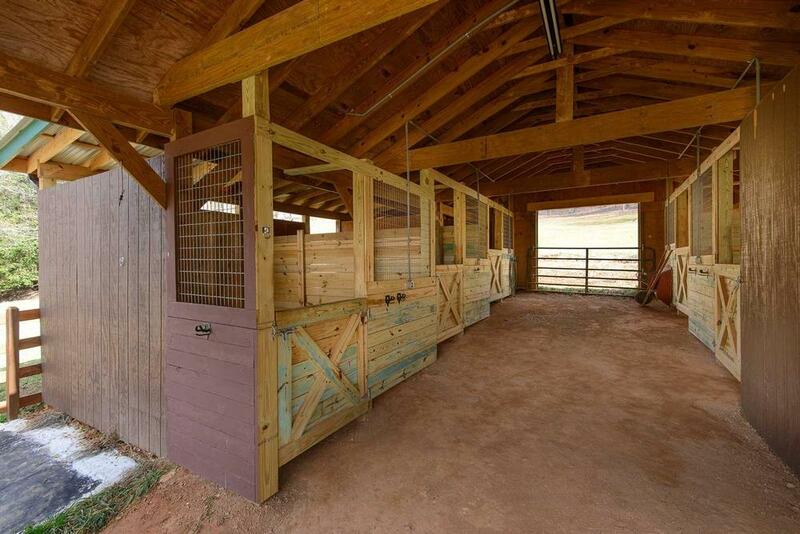 But even if you don’t ride, Serenity Lodge and Stable is the perfect spot, especially if your group is large. 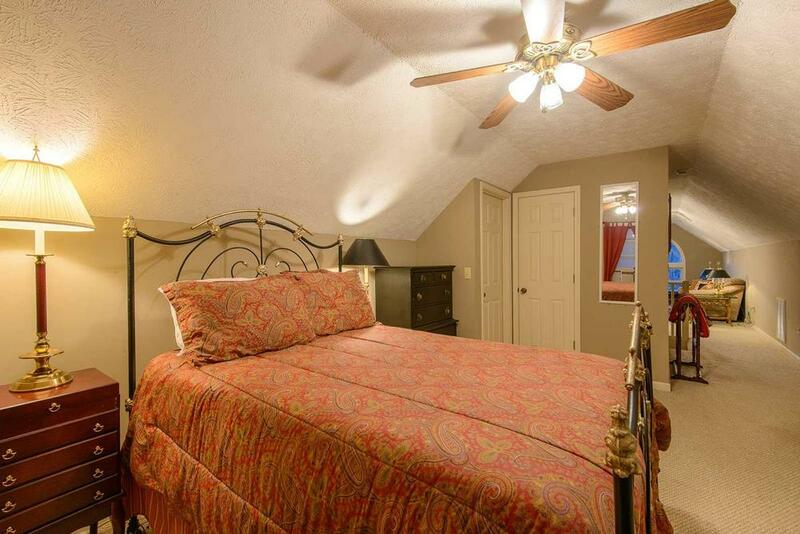 With six bedrooms that sleep 12 guests, it’s ideal for large families, a couples’ getaway with friends, or a long weekend with the girls or guys. 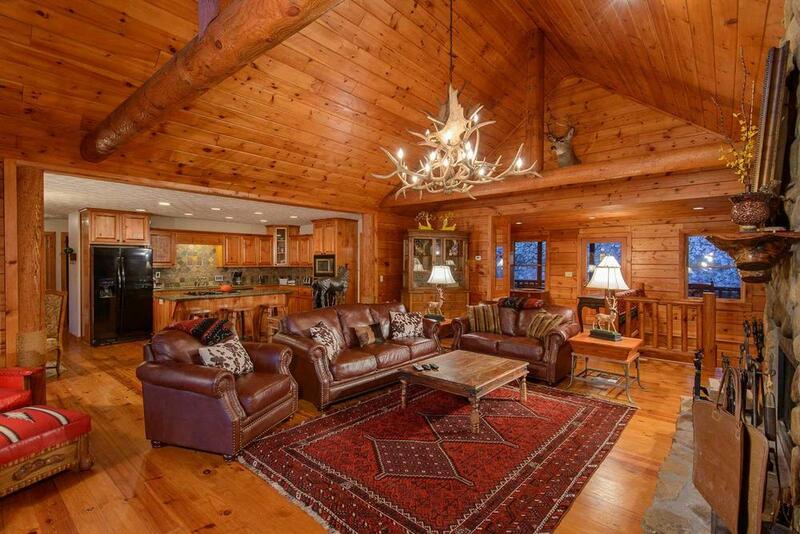 Serenity’s rooms are elegantly rustic, with exposed beams, wood burning fireplace, sumptuous leather sofas, ceiling fans in every room, and unusual touches like handmade antler chandeliers. With two fully furnished kitchens, two sets of washer-dryers and four and a half bathrooms, the cabin can handle all the needs of the guests. 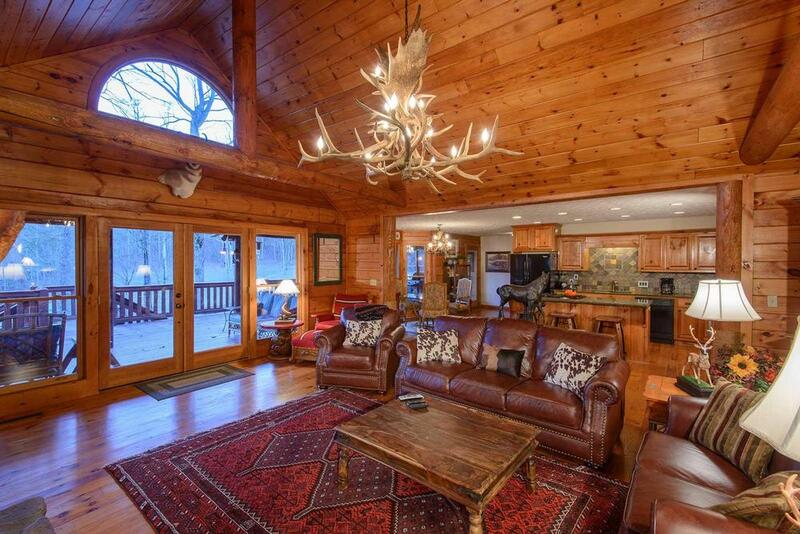 You and your guests can spend your days exploring the woods on and around the property, where you’re likely to spot deer, or enjoy the spectacular mountain view from the decks surrounding the cabin. 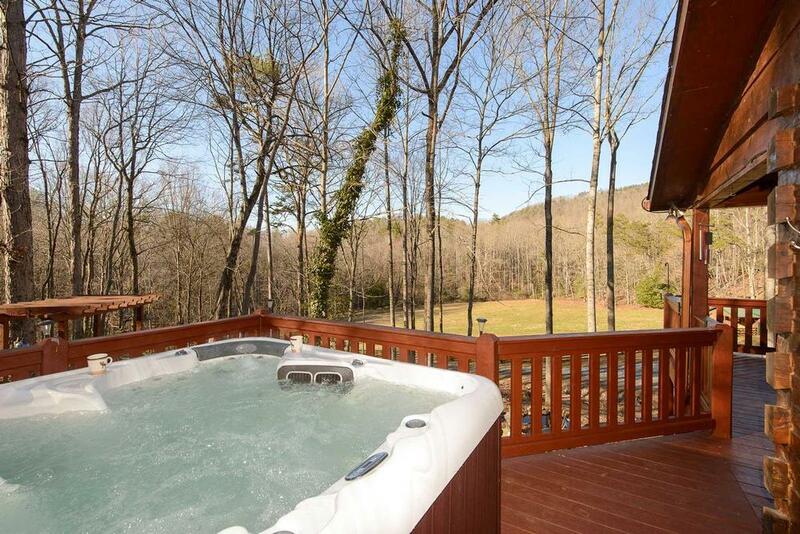 There, you can soak in the hot tub, nestle in the porch swing, or fire up the charcoal grill for a barbecue and have your meal outside at a table for eight. 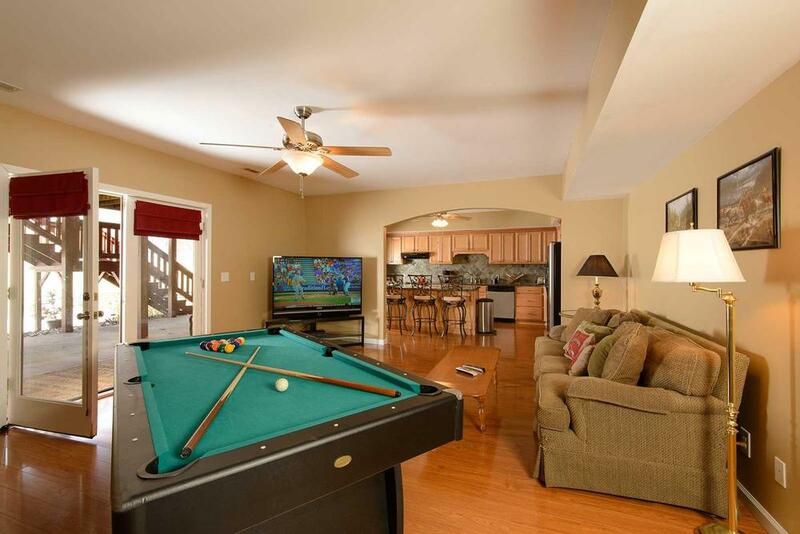 Later, you can watch TV on any of Serenity’s three HD flat screen TVs, all provided with DirecTV, sports and movie channels, or play ping pong, pool, cards or board games in the game room. 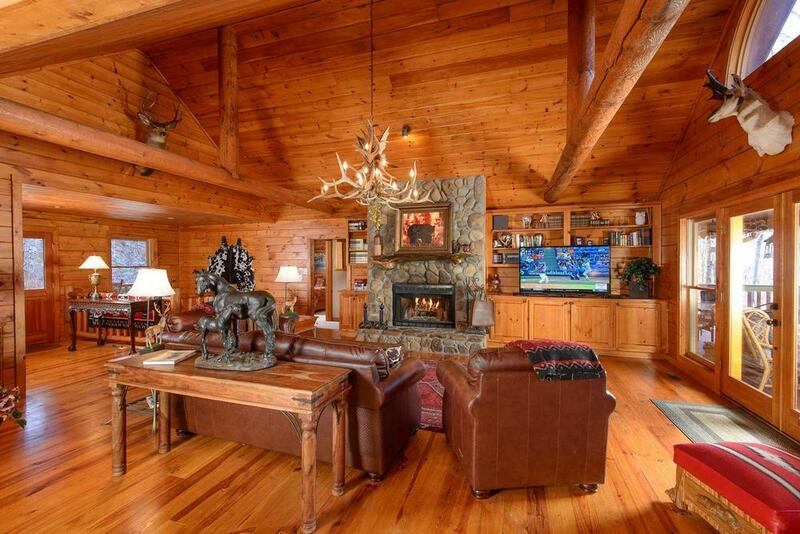 The cabin has high-speed wireless connectivity and a printer, so feel free to bring your devices. 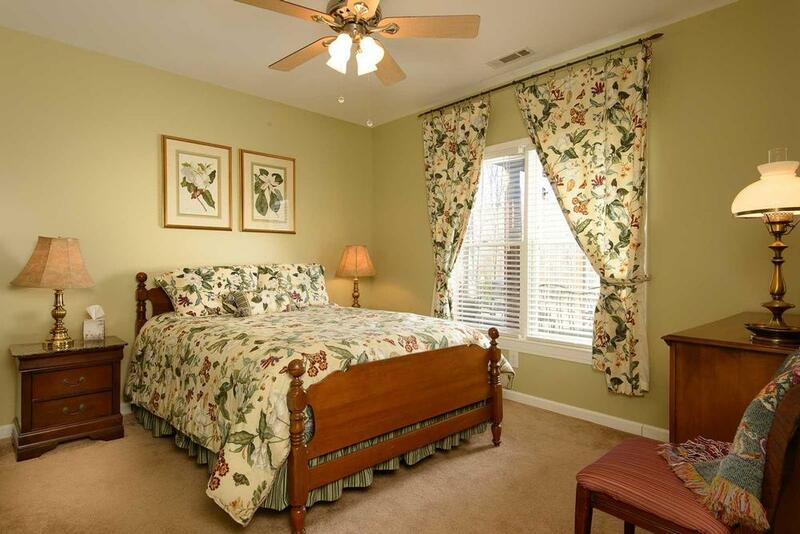 When you’re ready to turn in for the night, you’ll sleep well no matter which bedroom you choose, as each one is uniquely and comfortably decorated with a luxurious king or queen bed, ensuring a restful night’s slumber. 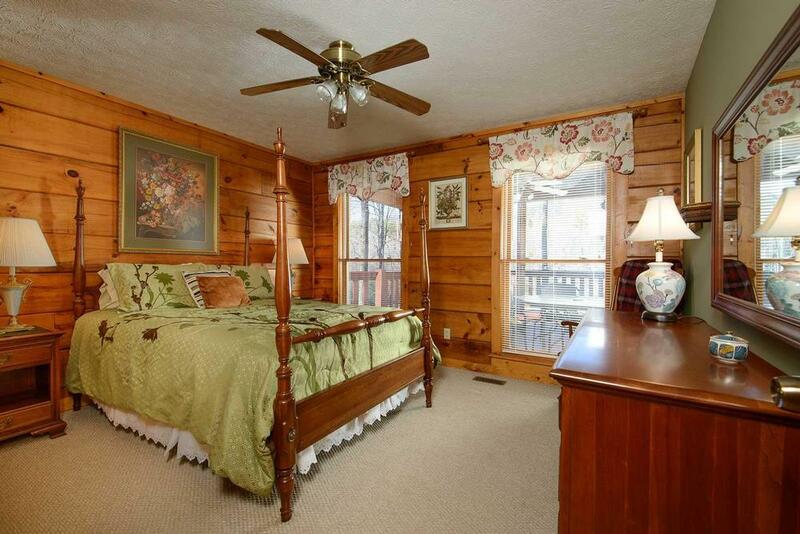 The master bedroom has an extra touch: it features covered deck access and a bathroom with massage-jet tub and double sink. Serenity Lodge and Stable’s vibe is restful, soothing and calm, offering you the opportunity to commune with nature in a spiritual way while you connect and celebrate with those you love. 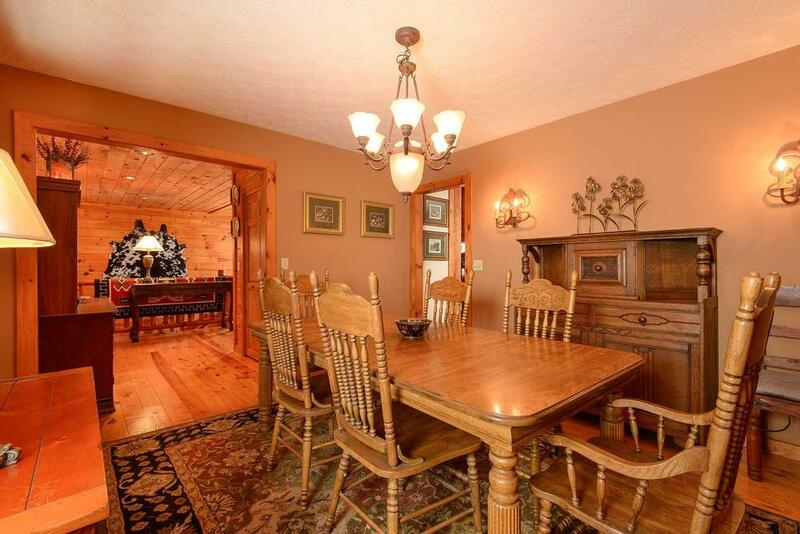 10/18 - I like the layout of the home. There is plenty of room for everyone to have their own private space. 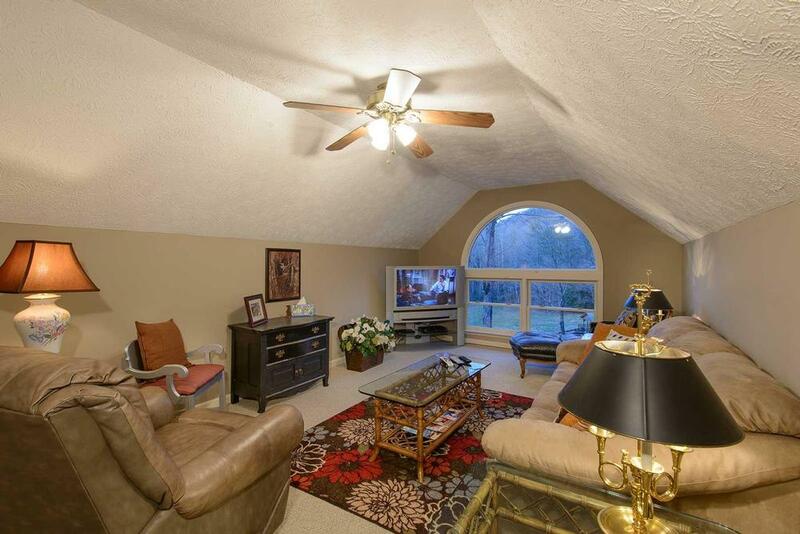 The great room is great for all coming together. We had 12 in our party, and enjoyed the home. The staff were always ready to assist in any way to make our vacation enjoyable. 06/18 - We enjoyed the spaciousness of the home. There were 12 of us and we never felt crowded. We ALL loved the space and are planning to make this an annual event! Excellent Customer Service and Great Place to vacation. 05/18 - Loved everything about the cabin. Friendly and helpful staff. I love the scenery and peacefulness. The staff were very helpful. I enjoyed everything and would come again. 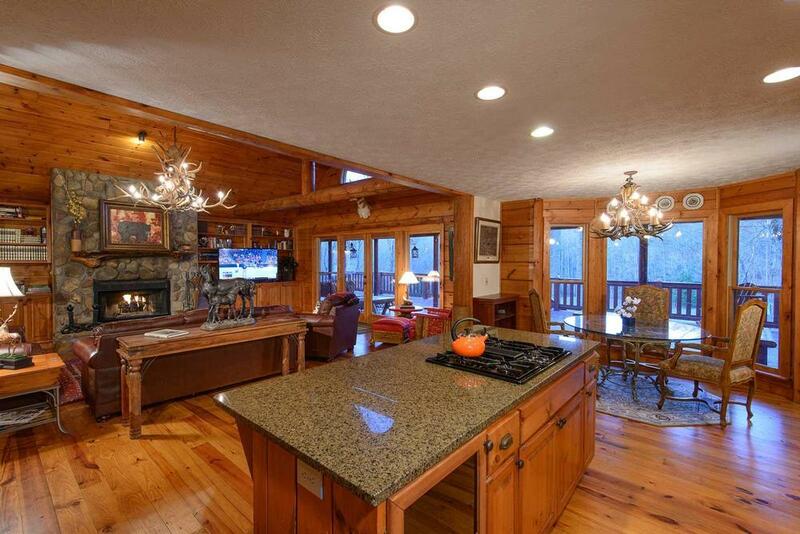 10/17- We enjoyed the open space from the kitchen to the great room. Plenty of space for each person to have their space. Very pleased! 08/17- The home was a perfect place for our family members on the occasion of our 50th Anniversary. 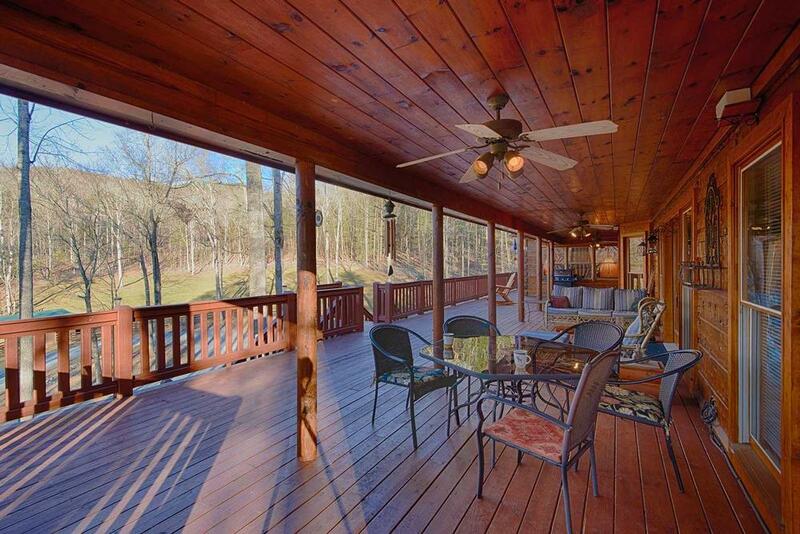 Escape to Blue Ridge was very helpful in all our dealings and handled them efficiently. 08/17- I like that it had two full home levels to separate parties when needed. 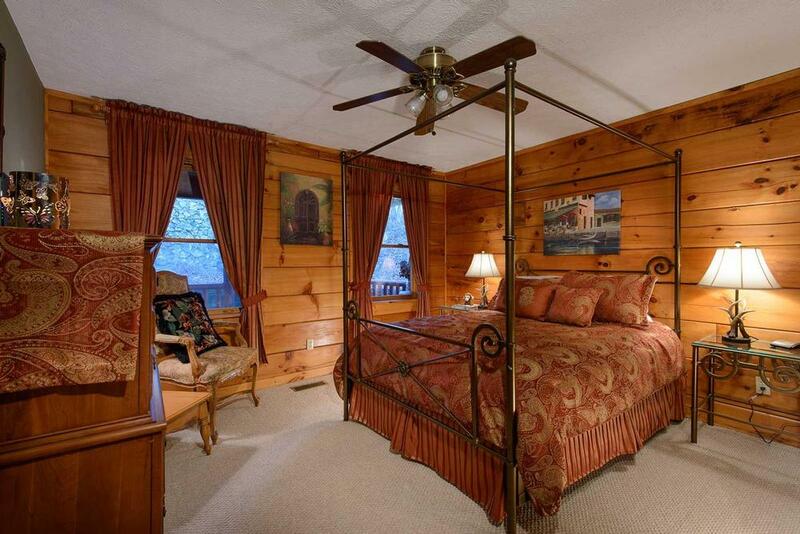 06/17- We were pleased with the cleanliness of the cabin and the accommodations in the cabin. Everything I forgot was there. Absolutely an amazing experience! 06/17- The rooms were very spacious. 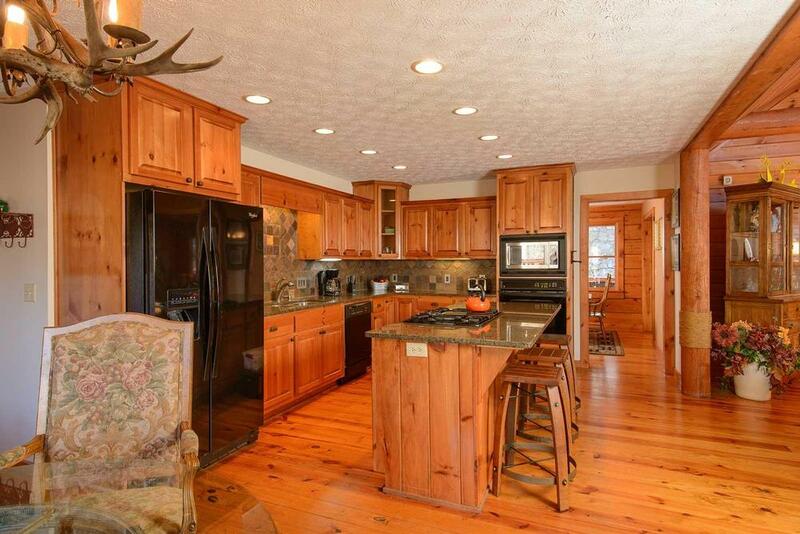 Phenomenal, we loved the cabin, two kitchens are an awesome idea. 06/17- The cabin is large and spacious. Also, the location is great. 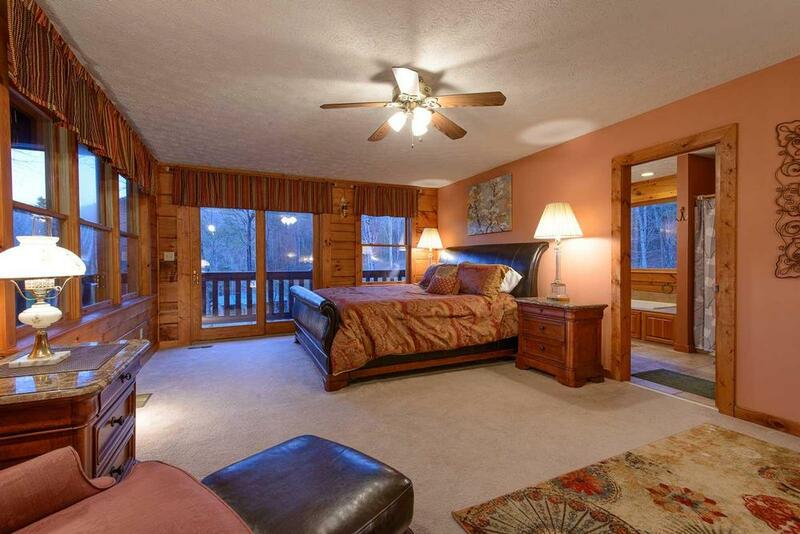 We have rented properties from Escape to Blue Ridge previously and enjoyed them every time. The staff is friendly and very helpful . We will continue to use and recommend Escape to Blue Ridge . 04/17- We loved the beautiful cabin and the scenery. 04/17- The privacy was incredible. 03/17- The home was very spacious. We never felt crowded even though there were a lot of us. This experience was great. Will definitely rent again. 03/17- Loved all the space we had for our family. We love this company .. always very professional and the cabins are always very clean and beautiful. 02/17- The home was beautiful. We had plenty of space for our family. Enjoyed our visit. Great company. I would stay in one of your properties again. 12/16- We loved the setting and the comfort of the home. There was plenty of space for the family. The home was clean and fully equipped with everything we needed. Dealing with your company was great. The staff answered all our questions and were more than willing to help. 12/16- Great home, very cozy but spacious. Ideal place for a large group. The staff were very polite and accommodating. 11/16- Beautiful home and everything was spotless and kept up. Escape to Blue Ridge does a great job of communication and very helpful...This will be our 9th year reserving a cabin with you. You do a great job. 10/16- We all enjoyed the spaciousness of the cabin. There were 13 people in our group, and each had the space needed to enjoy a vacation. 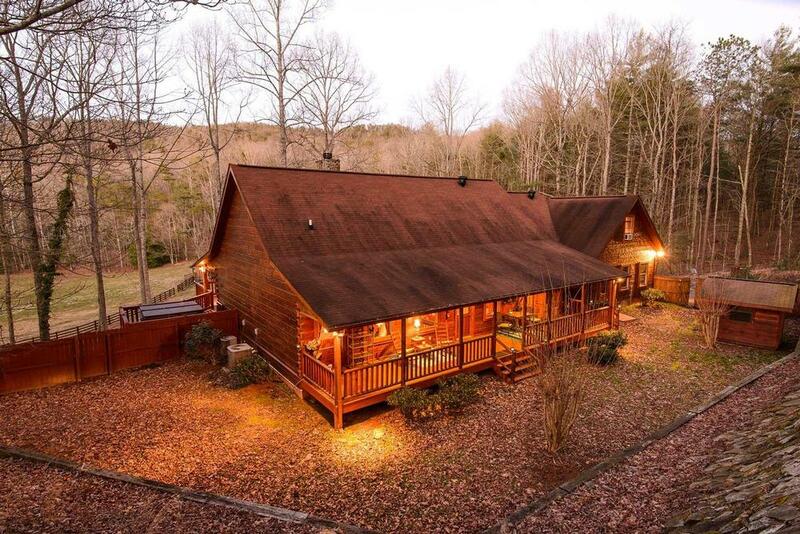 We have stayed in this cabin for the last two years, and have booked it for Thanksgiving 2017. Very pleased with all communication. 07/16- The size of the house was just right for our family. We loved the location. The hot tub and pool table were a hit. 07/16- It was the best cabin experience I ever had, it was extremely quiet and private. 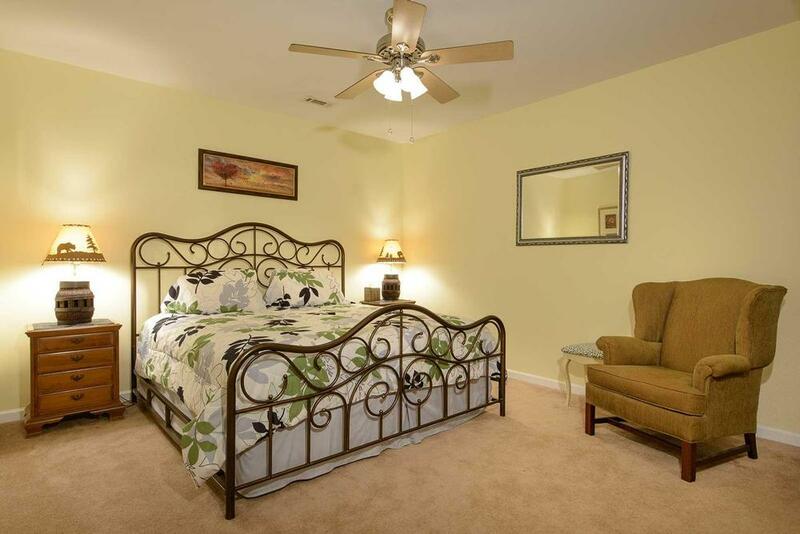 Very spacious, clean, with all the amenities needed. Your Staff was great from start to finish, very courteous and answer all questions. I will be calling for reservations again and will highly recommend this experience to anyone I know. Thanks for great time and experience. 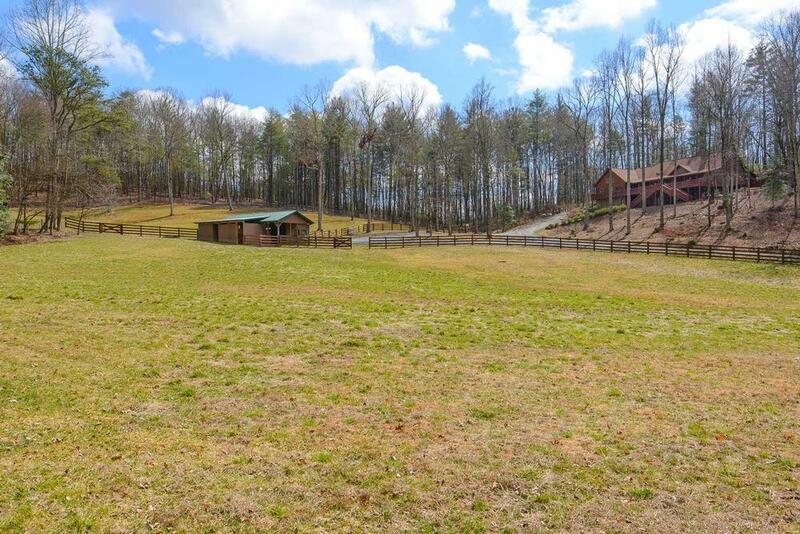 07/16- Spacious with lots of bedrooms and bathrooms, close to town, private & quiet. Easy access from major highways. Large porch. 06/16- It was very spacious for our group of 12 adults. It was also very secluded. My experience was great. I had a few phone conversations and both times the ladies were very helpful. 04/16- Everything was to my liking. 03/16- The layout, decore and size was perfect for my family. The amenities realy gave a boost to the festivities. I was impress with the attention to detail and the open line of communication. 02/16- Enjoyed the open spaces and beautiful scenery! It was children and pets friendly. Very enjoyable experience. We booked to return in October. 01/16- Very peaceful location, very secluded. Great layout of the house for a large group. Great experience with the management company! Very professional and organized. 01/16- During my stay it rained over 95% of the time. We were still able to sit outside due to the really big decks and there were plenty of games and things to keep us occupied on the inside. Your company is very professional to work with and I do love the KISS system (keep it simple stupid). This was my 4th time with your company and it seems to get easier each time. Although, I do not see how you can improve on your present system. 12/15- Great Home very spacious. Outstanding company to do business with. 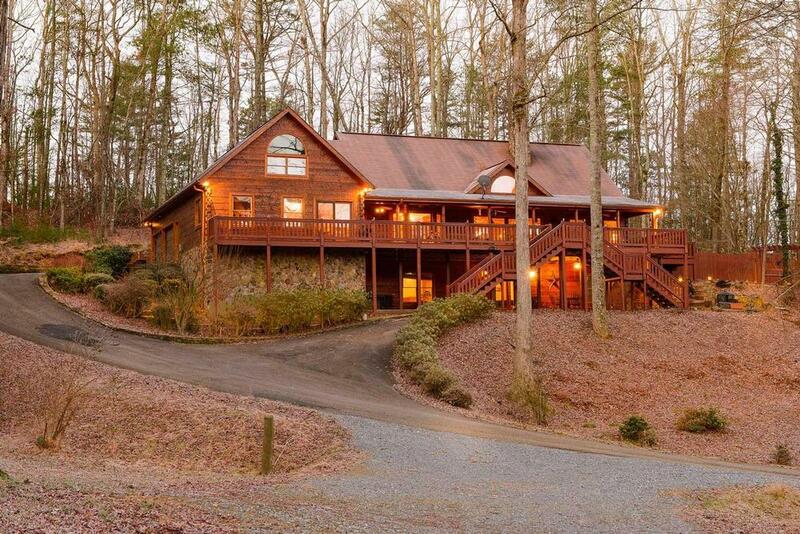 Escape to Blue ridge will definite be used for future bookings. 09/15- Very secluded but not to far from town. Nice place and professional company. 06/15- very spacious, didn't need the second full kitchen because the main kitchen was plenty big, although it was nice to have a second refrigerator. Very nice and very helpful when planning a trip.